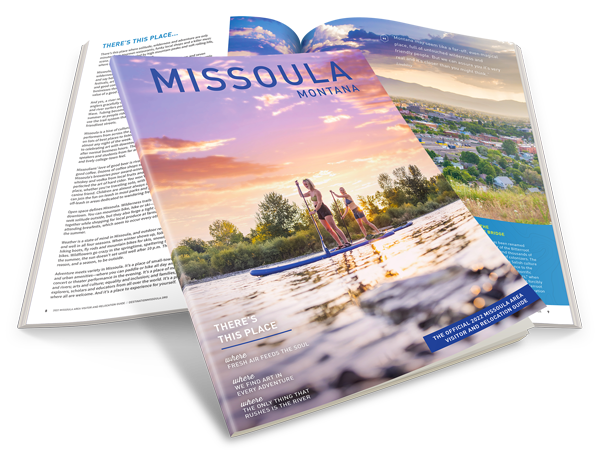 Destination Missoula provides resources to local and national media professionals developing stories on the area. Learn more and drop us a line below. Welcome to Missoula, we are excited to share our city with you! Missoula is unlike any other city in the Rocky Mountains. Nestled in the mountains and surrounded by wilderness areas, Missoula is home to outdoor enthusiasts as well as writers and artists giving Missoula it’s unique art and culture scene that blends seamlessly with outdoor adventures. On any given day you can find kayakers and surfers out on Brennan’s Wave in the Clark Fork River while on the riverbank an artist may be painting. Missoula is the centrally located in Western Montana amongst the Rocky Mountains. It is approximately 385 miles south of Calgary, Alberta; 478 miles east of Seattle, Washington; 894 miles north of Denver, Colorado and 1,182 miles west of Minneapolis, Minnesota. Missoula has a population of approximately 69,000 residents. The largest industries are agriculture, tourism, forestry, health care and education. With a fairly mild climate year round, the average temperature in Missoula is 25 degrees Fahrenheit in January and 80 degrees in July. The region is fairly arid and receives about 13 inches of moisture per year. The valleys receive about 40 to 60 inches of annual snowfall, while the mountains receive up to 350 inches. In the valleys, the growing season is typically 100 to 125 days. Destination Missoula provides assistance to press curating stories about Missoula as a travel destination. Have questions about our area? Need images of our iconic areas or assistance coordinating a press visit? We have the answers and are happy to help guide you to the information you seek for your Destination Missoula story. Nestled in the Northern Rockies of Montana, surrounded by seven wilderness areas and at the confluence of three rivers, Missoula is an outdoor enthusiast’s dream. Missoula is known for its blue-ribbon trout fishing (made famous by A River Runs Through It) and spectacular natural beauty. Take a relaxing hike or exhilarating bike ride in over 60,000 acres of wilderness minutes from your hotel. The opportunities are limitless. Not to mention Missoula’s close proximity to Glacier and Yellowstone National Parks. Missoula has unparalleled natural beauty and the cultural vibrancy to make your experience unforgettable. You can kayak, raft, tube or surf in downtown on the Clark Fork River. That’s right – we surf our rivers in Missoula and Brennan’s Wave, located in the middle of downtown, is the perf ect place to learn. So, in a place like Missoula, it is hard to compete with the great outdoors. Fortunately, Missoula’s arts and culture scene is a worthy contender and it is just right down the street from the action. From contemporary to Western art galleries and museums, an award-winning symphony, world-famous ballet, live theatre and international festivals, Missoula is replete with cultural experiences to satisfy every taste. There are certain foods that “shout” Missoula. Freshly caught trout, wild huckleberries and Dixon melons just scratch the surface. Missoula is all about sustainable, locally sourced, farm-to-table epicurean experiences. From five-star restaurants to a budding food truck culture, and everything in-between, this foodie’s haven will satisfy the most discerning tastes and varied pocketbooks. Handcrafted beers, wine, coffee and distilled liquors perfectly compliment every meal and are signature Missoula. The Bitterroot Trail is about connection—connecting with each other, the land and the rich history of the Bitterroot Valley. For approximately 50 miles, this scenic trail connects the charming small towns from Missoula to Hamilton, Montana, allowing riders to experience the wonder and beauty of the valley as they cycle (or trek) along the winding Bitterroot River between the rugged Bitterroot and Sapphire mountain ranges. For decades, the communities along the trail worked to bring their vision to life. No small feat, grant funding and patience paved the way for this remarkable and historic path. And with it comes the launch of the annual Montana Bicycling Celebration, which will take place every summer. The trail motivates locals and worldwide visitors alike to get outdoors, enjoy unlimited access to recreation opportunities in the region and connect with the natural beauty of the Bitterroot Valley, its merchants and its devoted residents. To learn more, visit www.bitterroottrail.com. The Seeley Creek Nordic Trail system is undoubtedly one of the best-kept secrets in the Rockies. The perfect combination of steady snow, excellent trail layout and consistent grooming makes the Seeley Ski Trails one of the premier Nordic trail systems in the region. Seeley Lake boasts an impressive amount of snow not found in neighboring valleys. This fresh powder is groomed to perfection daily by a dedicated crew of volunteers. The trails consistently receive rave reviews and regular use from skiers living within a 150-mile radius, while races and other events attract skiers from far and wide. There’s a trail or loop for skiers of all levels and abilities, from devoted racers to families looking for a healthy outdoor activity in the crisp winter air. To learn more, visit www.DestinationMissoula.org/SeeleyRocks. Missoula will spend much of 2017 on exciting expansions of many core community resources that serve both locals and visitors. Southgate Mall—offering the best shopping experience in Western Montana—is undergoing a 70,000-square-foot, $50 million renovation. The mall will transform into an urban-style district complete with housing and new entertainment and dining options, including a dine-in movie theater. Completion is set for spring, 2017. To learn more, visit http://shopsouthgate.com. The University of Montana is closing in on the completion of the new Missoula College campus addition alongside the Clark Fork River in downtown Missoula. $29 million in public funding and an additional $3 million in private funding will bring an impressive new addition to the campus and the community. Missoula College will house 30 programs in fields from business technology to the culinary arts. To learn more, visit http://mc.umt.edu/. Downtown Missoula’s beloved Wilma building and theater were recently renovated. Constructed in 1921 as a vaudeville house, The Wilma has served as the community’s movie house for the majority of its history. In the 1980s, The Wilma began to once again host live entertainment. In March of 2015, The Wilma was acquired by new owners and work began on a major renovation and restoration of the historic theater, with investments in an entirely new infrastructure, renovated stage, first-class entertainer accommodations and one of the best sound systems in the West. The Wilma is now a state-of-the-art facility housed in a building with rich history. To learn more, visit http://thewilma.com/. The Historic Merc Redevelopment Project will also kick off in 2017. One hundred and thirty-seven years after the first stone was laid, the historic Missoula Mercantile building's redevelopment begins anew. Building on years of efforts by private and public entities, a new vibrant community, a center of commerce and a place of gathering is just around the corner. 110 North Higgins was built in stages beginning in 1877 through around 1891, and from the start was the economic and social heart of an emergent Missoula and beyond. Today, Missoula's downtown has once again become the center of the city and The Merc will once again be at the city’s heart, featuring dining, lodging and shopping enhancements for Missoula. To learn more, visit http://themercdowntown.com. Located a scenic 140 miles south of Glacier National Park and an easy 270 miles northwest of Yellowstone National Park, Missoula is more than a halfway point between parks: it’s a must-stop destination. Visitors can choose from three scenic routes between the parks, with Montana’s Garden City a convenient stop along any of those three routes. In a place like Montana, it is hard to compete with the great outdoors. Fortunately, Missoula’s arts and culture scene is a worthy contender. From contemporary to western art galleries and museums, an award-winning symphony, a world-famous ballet, live theater and international festivals, Missoula is chock-full of cultural experiences to satisfy every taste. How many places can you catch a wave and a show on the same block? To learn more, visit our Arts and Culture page. Missoula’s is a city rich in culture and community, and—with its naturally beautiful setting—proudly makes outdoor entertainment a high priority. The city’s residents deeply value parks and trails, and the addition of the Fort Missoula Regional Park will give the city even more capacity to host outdoor festivities. The result will be a unique setting where history, culture, wellness and sport all come together. The park will include state-of-the-art sports fields and will encompass a 246-acre boundary with a specific emphasis on the city-owned 83 acres of property. The park’s well-thought-out design will focus on multi-generational usage, bringing in all-weather surfaces, nine multiuse recreation fields for basketball, softball, soccer, and even croquet and pickleball, 10 miles of trails designed for all ages, a large pavilion for hosting events and dozens more elements honoring the historic era of Fort Missoula. To learn more, visit www.fortmissoulapark.org. This talent-infused city offers something for everyone every night of the week. From acoustic solo performances to legendary rock and rollers, Missoula is a little city with a big nightlife. This musical mecca offers a wide range of live performances throughout the year. Many of Montana’s largest music events are held in Missoula, including rock concerts, outdoor symphony concerts and the International Choral Festival. Whatever your taste in music, chances are good Missoula will offer something you love. Music leaders in the community are bringing in a variety of entertainment in newly renovated venues including the Wilma Theatre, Big Sky Brewing, Top Hat Lounge, University of Adams Center and Ogren Park at Allegiance Field, all of which have emerged as successful and consistent contributors to diverse music experiences for locals and visitor year-round. To learn more, visit our Events Calendar. Wild huckleberries, freshly caught trout and Dixon melons are just a few of the local foods that shout “Missoula.” This is a city wildly committed to sustainable, locally sourced, farm-to-table epicurean experiences. From five-star restaurants to a budding food truck culture, this foodie’s haven will satisfy the most discerning tastes and varied pocketbooks. And, you’ll find signature handcrafted beer, wine, coffee and distilled liquors to complement every meal; local Missoula shops like to collaborate, offering combinations you’ll only find in Missoula. To learn more, visit our Food and Drink page. Please fill out the form below, give us a call or email us if you have any questions. Submit the following Media Request form at least 30 days prior to your departure. If you are a freelance travel journalist, please also submit a letter of assignment with your editor's contact information as well as 3-5 travel articles published within the past 12 months. The submitted travel articles must include the journalist's byline and date. Please provide 3-5 past examples of our work published within the last 12 months. Please provide two names of tourism offices, hosts or PR reps that have provided assistance in planning a press trip on your behalf. Please include name, email and phone. Please provide as much detail as possible, include topic(s) and length. Provide the names of each person with your group. Provide the names & ages of each child with your group. Are you requesting meal assistance? Do you plan to include a mention of the hosting restaurant/attraction/hotel in your coverage? Have you visited Missoula before? Do you have any health concerns or physical limitations?